I’d like to thank the good dude, for having his hand on me every time my front tyre aqua planed, or my back tyre completely let go. I’d like to thank Warr for convincing me the Grand Challenge is a good idea. To Lee Rusty, and his crew for organising this absolutely insane ride. Thanks to zapf for always smiling at the stops when everyone else looked so beaten. So the route was amazing. I was a bit concerned about route planning, and getting lost, so lots of preparation had been done for the last few weeks ensuring I could find my way. Upon arriving at Turangi I see the map from another room, and immediately recognise EVERY bit of it. sweet !!!! So off we head at 3:08. 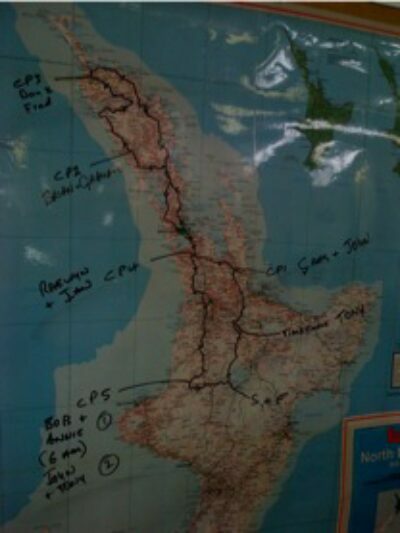 My first goal is to get to Auckland before sunset, and Dargaville by 9pm. This seems like a pretty achieveable goal. Once I get past the turn off from kinlock I’m on “local” roads .. .sweet. Old Taupo road was a breeze, and has been done plenty in the last few months. across to Putaruru, Tapapa, then on to Old Te Aroha rd - and the plan to make it to Paeroa in a tank was quickly changed to a stop in Te Aroha for gas. Warr and I were on our own at the gas station. Turns out our stop in Te Aroha was a blessing, as the check point was chocker block full of bikes waiting for gas, so we got our card punched, then off we go. Up SH 2 was great!!!! Carving up everything in sight, even Warr commented later on my “commitment” to over taking things .. naughty, naughty me, but boy it was fun. On to SH 1 and the southern motorway. Warr needs his license for work, so he disappeared out of my mirrors, but then re-appeared once I hit heavy traffic between Mount Wellington, and the city. We make it to the service station on the north shore. We’ve only done 150 ish kms on this tank, but the heavens have opened, and we know we can’t make it to Dargaville, so we may as well stop and get the wets on. Back on the motorway, and I had rain on the inside of my visor, I should have kept my helmet closed at the gas station, oh well, slow going as vision is lacking. turn towards Dargaville, and you guessed it - WIND !!!! I remember in June this being an issue, but I reassure myself that once through Dargaville, the wind should ease. Heading north from dargaville, the wind howls, and the rains pelts ! Then the biggest slide ever !!!!! Some how after the back kicking WAY out, then suddenly grabbing, I find myself upright, and pointing in the right direction. I catch a quick glimpse of 3 headlights behind me waving in all manner of directions, there is obviously something very slippery on that corner. I’m later told by zapf it was cow crap across the entire corner .. erk! In to waipoua forest (spelling?) and the speed drops to a frustratingly slow 50 kph, but the road is so slippery its making me so nervous. Warr however disappears in to the forest .. he must trust his tyres more than me. 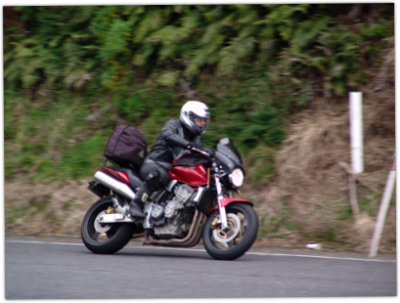 I follow a GS1200 through, and I think I am holding some one up behind me. I gave him plenty of opportunity to pass me, but he didn’t, maybe he was “borrowing” my lights. There is another major “whoops” moment going through the forest on a left. Something was right on the apex of a corner. Out of the forest, and the BMW roars past me. Fortunately I can increase the speed now, up to a sedate 100-110. Myself, and the GS are catching someone. I’m soon to find out it is warr .. hmm wonder what happened to him. So we stop for a 5 second “which way should we turn moment”, then Warr takes the lead, I behind him, and the GS behind me. Up to Kaitaia we head. We stop for 20 minutes here. Smoke, Panadol, No-Doz, food and drink. North to Awanui, then east on to SH 10 the 3 of us head. Myself, Warr, and newly found friend Luke, the GS1200 rider. The road is dry here - woohoo. I’m leading and set a sedate 120 speed. I’m starting to feel the pain, and I guess the others are too, so I don’t want to push it, if they want, they can over take, but they don’t. On to SH1 and head south. The straights past marsden point are killing me !!! Warr has taken the lead, and set a pace I can’t keep. The winds from the west are just freaking me out, and my speed drops to about 90kph through here. Mr GS1200 isn’t trying to over take so I guess he is suffering the same fate. The Brynderwyns (spelling?) is Warr’s home territory, so there is no sticking with him, but somehow before Wangarei I catch him. We stop for a planned gas stop here, and watch zapf and his group go past. I thought the wind had been bad - I had no idea !!!!!! Warr put a bit of a gap on, so I was left leading Mr GS1200 through SH 16. After some time of riding at 70 kph, I thought “this ridiculous, I’ve got to do better, so I gave myself a stern talking to about relaxing in the wind, and looking for the driest part of the road. Soon enough Mr GS had vanished from my mirrors, and I can see a tail light ahead .. yay for me ! So we reach helensville, and Mr GS catches us under “city” speed limits. Some how we managed to not follow 16 and ended up on SH 18 heading towards Takapuna. Over the bridge however .. erk, eek, crikey, and even the odd expletive !!!! 60 kph, and I was getting blown across lanes !!!!! Down on to the southern motorway, and “relative” shelter, so I punch it down the southern. Warr turns up 3 or 4 minutes later, and Mr GS about another 10 minutes. Apparently Mr GS had got “lost” on the motorway, and ended up in the city, and heading up queen street .. yuk! She tells me, she’s going to get the kids up, and come down to Whatawhata gas station and wave at us. Warr leads us out to Pukekohe, but seems a bit lost once we get there, so I take the lead, and head us southern down SH 22. Now SH 22 is like the local pub for us Hamilton folk, so I’ve got plans to scorch down here. Alas the weather has other plans for me. The road has almost no traction, so I find myself crawling around corners at a snails pace. No one is over taking me so Warr is obviously happy with the pace. Mr GS quickly disappears from my mirrors, and I think to myself, maybe my pace is quicker than I think, but I’ll tell you what ! there have been days that SH 22 has been a blur, so it doesn’t feel very fast. As we reach Waingaro, the blue JUST starts to come out, the sun is slowly rising. I start to see the road conditions and think, yuk! I’ve spent the last err, countless hours, picking the “dry line” on the road, and here comes a corner with no dry line. Oh dear I think to myself, get ready for a “pucker” moment. Sure enough the Hornet bucks and kicks and rears, and the Metzelers struggle to find any traction. A quick glance in the mirror, and I see a tail light pointed at me. He’s struggling getting his bike up, so I think his legs can’t be hurt. He’s wearing a PVC rain coat which isn’t torn, so his arms and body can’t be hurt, and after a quick drilling he reassures me he is not hurt hurt. WHEW .. and thank good dude !!!! Right the bike up on to the wheels and assess damage. Broken fairing, broken mirror, mildly bent foot brake . .sweet!!!! out with the trusty vice grips, remove fairing, stash in the bush, and off we go. In the Mean time Mr GS has caught us up, and stopped with us. We reach Whatawhata to discover my Wife and kids weren’t there, maybe they slept instead. I later found out they gave up waiting, and had waved to plently of bikes, but thought we must have gone through earlier .. oh well. Next dose of no doz .. bonza! Down to 8 mile junction and head south to Taumaranui. I’ve got the lead now, and for the first time I actually use my tank bag !!!! A quick read of the instructions while riding reveals approx 45kms turn right toward Ohura. So I take a reading of my speedo, then concentrate on finding that “dry line” again. right on to Ohura road, and eek! its a goat track - 30 kms of cornering at 50kph or less !!!! geez that was hard! So a snails pace was held all the way to Ohura. Out to Taumaranui, and I wave Warr ahead because I have no idea how to get to Turangi from here. Over the saddle Things start to freeze. The puddles in the bottom of my boots turn to blocks of ice. The tears in my eyes feeling like they are freezing, and my eyes start to really hurt. Quick check of the speedo says 23 kms left. This is the first time in journey I find myself counting the kms, waiting, hoping, wishing I could I finish.